How natural is your orange juice? It is important to know what’s in your food, because a lot of people choose to feed certain things to their children without realizing how false the claims on packaging usually are. Very disturbing. 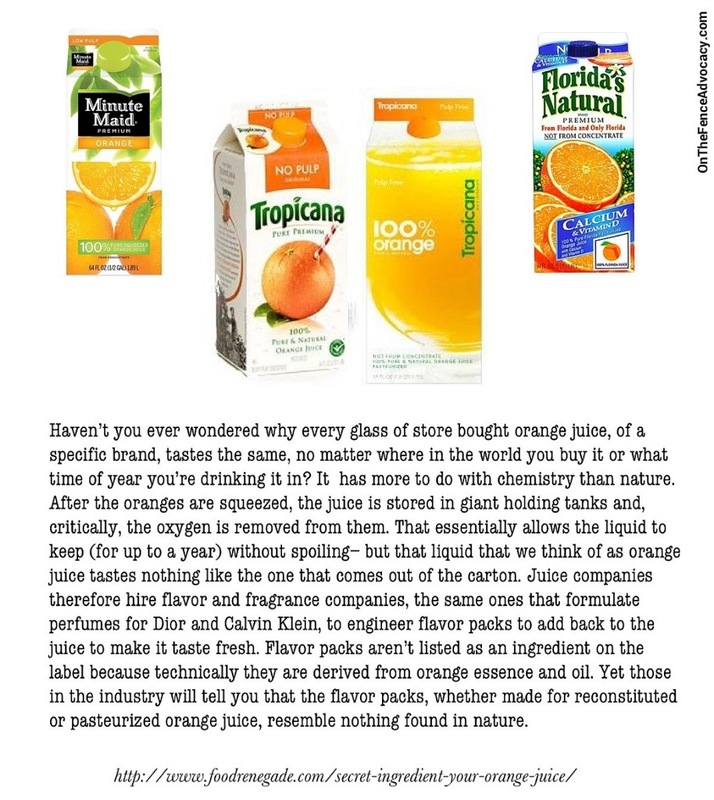 And it is not just one particular juice, the article explains that it is most orange juices sold in stores. “Do you buy orange juice at the store? If you do, I’m sure you’re careful to buy the kind that’s 100% juice and not made from concentrate. After all, that’s the healthier kind, right? The kind without any additives? Haven’t you ever wondered why every glass of Tropicana Pure Premium orange juice tastes the same, no matter where in the world you buy it or what time of year you’re drinking it in? After the oranges are squeezed, the juice is stored in giant holding tanks and, critically, the oxygen is removed from them. That essentially allows the liquid to keep (for up to a year) without spoiling– but that liquid that we think of as orange juice tastes nothing like the Tropicana OJ that comes out of the carton. When the juice is stripped of oxygen it is also stripped of flavor providing chemicals. Juice companies therefore hire flavor and fragrance companies, the same ones that formulate perfumes for Dior and Calvin Klein, to engineer flavor packs to add back to the juice to make it taste fresh. Flavor packs aren’t listed as an ingredient on the label because technically they are derived from orange essence and oil. Yet those in the industry will tell you that the flavor packs, whether made for reconstituted or pasteurized orange juice, resemble nothing found in nature. Good question! As with all industrial foods, it’s because of our convoluted labeling laws. You see, these “flavor packs are made from orange by-products — even though these ‘by-products’ are so chemically manipulated that they hardly qualify as ‘by-products’ any more.” Since they’re made from by-products that originated in oranges, they can be added to the orange juice without being considered an “ingredient,” despite the fact that they are chemically altered. So, my first piece of advice is to get out of the juice habit altogether. It’s expensive, and it’s not worth it. My second piece of advice is to only drink juices that you make yourself.